Become a Certified Medical Examiner in the National Registry before the May 21, 2014 Deadline! Practice Test Available: 200+ question practice test designed to test and supplement examiner knowledge. Click here to learn more. 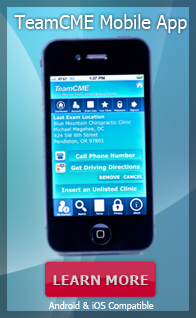 Continuing Education Credit (CE, CME-1): For details click here. 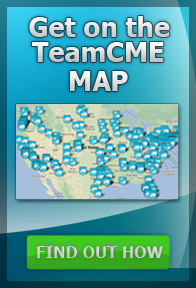 TeamCME is an Accredited National Registry Training Organization recognized by the Providers of Accredited Education (PACE) program of the Federation of Chiropractic Licensing Boards. PACE is a Nationally Recognized Accrediting Body listed on the FMCSA National Registry website. Chiropractic physicians from the states of Washington and Michigan do not qualify. DCs in the states of Virginia and Connecticut may not be qualified, action is pending. Naturopathic physicians should contact their state licensing agency before registering.